We want AUCA to be more green and environment friendly and introduce sustainable practices and support ecological initiatives. 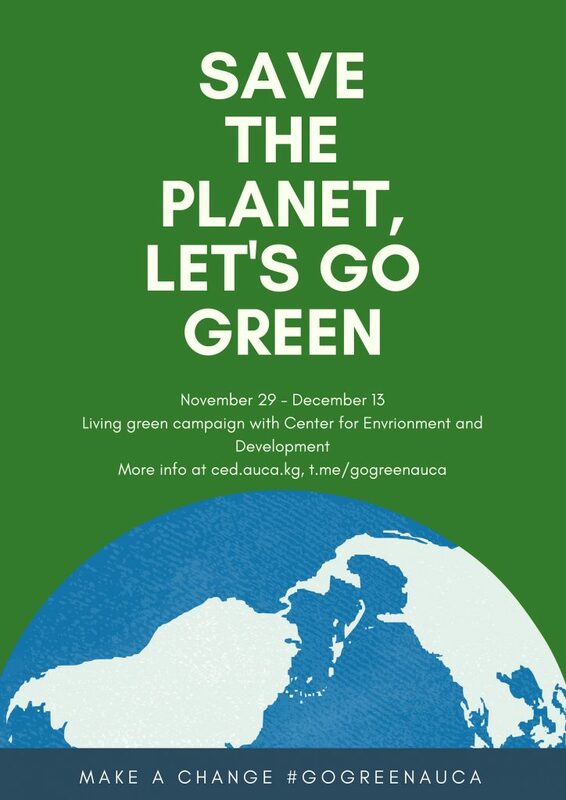 Center for Environment and Development (CED) AUCA asks you to join our «Go Green AUCA!» campaign from November 29 to December 13. Don’t buy new plastic bags (you can reuse old bags). Don’t throw away food (it’s always nice to share with your friends). Don’t buy food or other goods in plastic wrap. Use public transportation, bicycle, or walk. Use minimum resources (don’t waste paper, energy, water. Sort the garbage (at least paper and plastic). Report at least once in 3 days about your progress and challenges of living green in any social media (Facebook, Instagram, Twitter) using hashtag #gogreenauca OR subscribe to our channel in Telegram “GoGreenAuca” (t.me/gogreenauca) and write about your experience there. The best stories will be awarded with prices and published on CED AUCA’s social media pages and website.